Sensei’s Diving Top – Banned in Legacy! Patrick and MichaelJ open on a tearful* goodbye to Sensei’s Divining Top. While the Top has drawn some bad press due to eating up the clock in recent years, there is no denying its contribution to a number of impossibly inventive decks. Cards from Kodama’s Reach to Shrapnel Blast to Counterbalance have all reached the top of the metagame. What will be obvious to you listening to this podcast is that the boys recorded “Anointed Procession Makes the Next Infinite Combo” before this week’s last minute addendum to the Banned and Restricted list. So yes, Patrick does a little Felidar Guardian + Liliana brewing… But there are still lots of other great nuggets in this episode (we think). This combination gives you as many Icy Manipulators as you would like… Except they can also attack for infinite damage. The advantage of this combination is that Eldrazi Displacer and Drowner of Hope are actually “good cards” rather than just combination pieces. After all, even if Anointed Procession is not part of your equation, Drowner of Hope is seven power across three bodies for “just” six mana. No, this podcast is not mostly about this cool new combo. There is also Patrick’s argument that Zombies will be Tier One, Mike’s continued love of cycling, and of course some misplaced metagaming around Felidar Guardian. * Okay maybe not that tearful in Patrick’s case. Sure, it’s Lightning Rift-like (or Astral Slide-like, if you prefer). 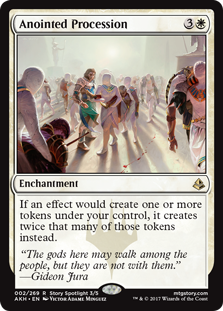 It screams to collaborate with tons and tons of cyclers printed in the vary same set. Untap with Drake Haven in play, and you have a ready-made source of defense, card advantage, and damage all at once. 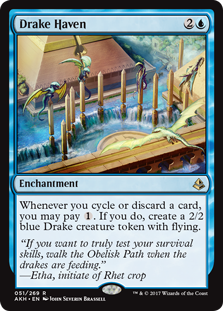 Mike thinks that Drake Haven could be a centerpiece of the new Standard… After all, it can counter and overwhelm Gideon, is highly synergistic with your own sweepers, and can chase down many Planeswalkers in the air, (at least when you have a turn). 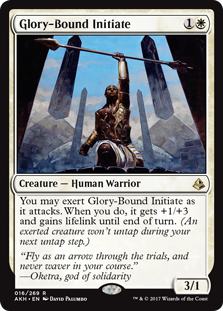 Glory-Bound Initiate can become 4/4 on its own, but may have to slow down. Enter Always WatchingDozens of cards are explored in this podcast. Mike and Patrick can’t wait to play Amonkhet! What a glorious set of abilities! A perceptive mage might even point out that Nissa’s casting cost is itself kind of a special ability… It is after all something special, something we haven’t seen before, at XGU. For one thing, you can cast Nissa, Steward of Elements for a mere GU. This is not a typical play, though, as Nissa will go directly into the graveyard if you do so… But maybe that’s okay. Maybe you’re on the Delirium track and you are okay spending two mana to put the Planeswalker type into your graveyard. Or maybe you’ve previously cast an Oath of Gideon or Oath of Ajani, letting you get away with that cheat. 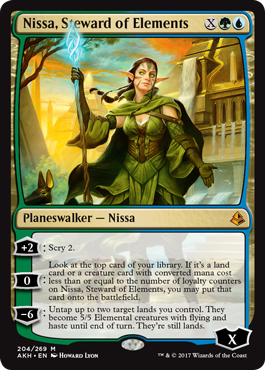 But even at 1GU Nissa is part of the rare breed of “three” mana Planeswalkers. The original Jace Beleren, as well as a number of Lilianas, have proven tournament Staples due to being only three mana. Nissa can come down for 1GU and immediately tick up with the [+2] to “start” at three loyalty (while giving you a nice look at the top of your library). Nissa’s “plus” ability is perfectly serviceable. It’s not the most exciting plus ability, but it does a couple of things well in her context. As we’ve already said, starting the three mana version of Nissa at three loyalty is potentially solid. Especially early, the ability to add two loyalty to Nissa can act as a proxy for defending herself. Separately, Scry 2 is extremely synergistic with Nissa’s second ability. Because it goes two deep you can know what you will hit, even after your next draw step, meaning you can theoretically ensure a 100% hit rate. : Look at the top card of your library. If it’s a land card or a creature card with converted mana cost less than or equal to the number of loyalty counters on Nissa, Steward of Elements, you may put that card onto the battlefield. Nissa’s second ability is erratic, but potentially powerful. If you use the Scry 2 ability, you can ensure a hit… But you don’t 100% need to. 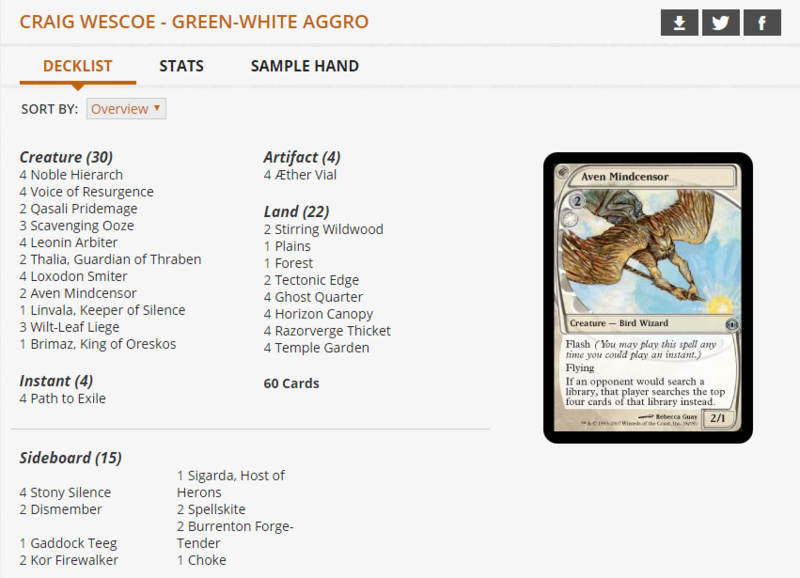 If Nissa is already at very high loyalty you might be able to hit even a big fatty like Ulamog or Torrential Gearhulk. Your worst case is of course using Nissa blind and missing, but on the low(ish) end you can also just use this as a mana ramp ability. It is not out of the question to use Nissa, immediately , hit a land, and have five or even six mana available the next turn. A more consistent play pattern might be to reveal two lands with [+2], draw one of the lands, and  the other into play. Three straight to five! Nissa is probably going to draw fire for “not protecting herself” but that isn’t 100% the case. The [+2] gives Nissa a bit of resiliency, but the ability to even sometimes land a creature to block is also a measure of defense (though, again, not super consistent). [-6] : Untap up to two target lands you control. They become 5/5 Elemental creatures with flying and haste until end of turn. They’re still lands. This ability is what sets Nissa, Steward of Elements apart. Who cares if she doesn’t defend herself if your intention is not to keep Nissa, Steward of Elements around? For the bargain price of eight mana (6GU) you can just Fireball your opponent for ten! Take ten in the air! Blammo! 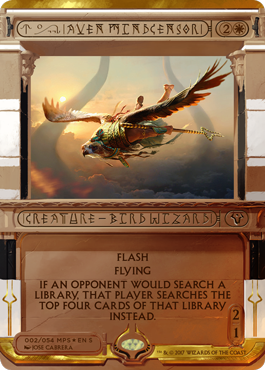 The “take ten” [-6] is not the most flashy or powerful Ultimate in the history of Planeswalkers, but its speed is like nothing we have ever seen before. A Ramp deck can land this ability out of nowhere. We can even imagine consecutive turns of ten plus ten, winning with no non-Nissa-Ultimate damage. New Perspectives, from AmhonkhetMichaelJ and Patrick return for a special bonus episode! Top Level Podcast has an exclusive preview from Amonkhet. Six mana is a bit steep for the ability to draw three cards, but Patrick claims that this card is actually a “draw four” … One of the cards is just a zero mana Fluctuator. This second line is what puts the “new” in the name. We aren’t just talking about a Fluctuator… This card is expensive but far more powerful. 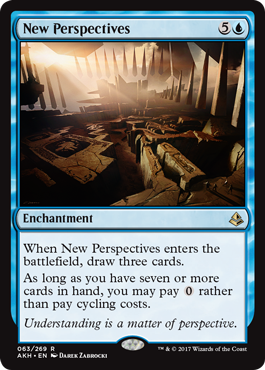 For one, New Perspectives will handle colored mana in a cycling cost, not just discount a 2 to 0. It opens the door to some big opportunities. For instance, why not start with Archfiend of Ifnir on five, untap with the Demon still in play, and then run out New Perspectives? Having (or drawing into) just one or two cycling cards — TAPPED OUT — can totally swing the board. This card represents — we think — a whole new way to play. 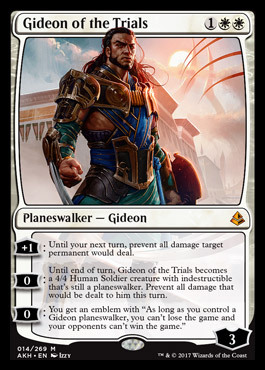 Gideon of the Trials from AmonkhetGideon of the Trials is a splashy new Planeswalker from Amonkhet. There are lots of things going on with this card that are interesting. First of all, it is only three mana. Like Jace Beleren and Liliana of the Last Hope before it, Gideon is likely going to find a way into appropriately-colored decks, just because it is so cheap. Conveniently, all three of Gideon’s abilities are meaningful and worthy of discussion. This is Mike’s favorite ability on the card. This ability is also great against Heart of Kiran. Not only can you shut it off damage-wise (no matter what mode it is in), the fact that Heart of Kiran is Legendary means that you effectively shut off all the copies that are stuck in the opponent’s hand. : Until end of turn, Gideon of the Trials becomes a 4/4 Human Soldier creature with indestructible that’s still a planeswalker. Prevent all damage that would be dealt to him this turn. If Gideon of the Trials only featured the middle ability, it would be comparable to True-Name Nemesis… a 4/4 “basically unstoppable” 4/4 for only three mana (but doesn’t play defense)? Pretty solid! This is the most straightforward of Gideon’s three abilities. It’s basically always good any time you don’t want to be using the [+1]. Gideon’s emblem is a little tricky. It basically is an emblem that makes present or future Gideons into Platinum Angels. This can be powerful — For example you can lock out (or at least buy a turn from) certain combo decks. But most conventional decks that attack to beat you can attack Gideon instead. Not awful by any means, but not decisive generally, at least not in Standard. All-in-all, Gideon of the Trials looks like the most powerful white card we’ve seen so far from Amonkhet. Oh… And bonus episode tomorrow! 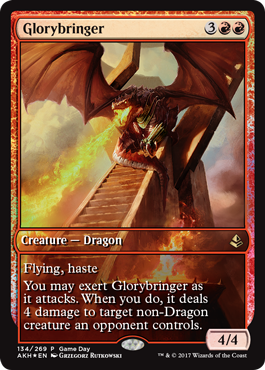 The superficial analysis is this: Glorybringer is a five mana 4/4 Dragon in red. It brings both flying and haste. Flying and haste are two awesome abilities, in fact. It is reminiscent of past five drop dragons like Thundermaw Hellkite and especially Stormbreath Dragon. Like Stormbreath Dragon, this 4/4 for five has a specialty. While Stormbreath Dragon was a powerful threat that could punish decks relying on Azorius Charm for point defense, Glorybringer is poised to punish creature decks and especially [other] mid-range decks. Mike and Patrick are both wildly excited about Glorybringer. The card is powerful and can potentially be a fast clock. Sadly, it does not automatically rule the sky… Or even rule the category of five mana 4/4 flyers. Consider Archangel Avacyn. You might mistakenly think the coast is clear and send in to brain the opponent for four, or exert to kill a small creature. The way wasn’t clear, and the opponent can deploy a contextually-better 4/4. What happens is that Archangel Avacyn enters the battlefield and gives its team (including itself) indestructible. When Avacyn goes to block… It will smoosh Glorybringer, but live itself. The only saving grace is that these indestructible Avacyn windows only last one turn (at least per angel). The real excitement around this card is its single-minded design of killing Gideon, Ally of Zendikar. Glorybringer has just the amount of power — and just the pinch of haste necessary — to come down and whack Gideon before the opponent can do very much about it. The really cool bonus here is that, due to the Exert option, you can take out Gideon’s Knight token, too. Top Level Podcast also covers a number of other Amonkhet cards this week, from Trueheart Duelist (Mike’s favorite) to Dusk // Dawn (Patrick’s). Aven Mindcensor is one of the first ever non-artifact Masterpieces! Pro Tour Champion (and Patrick’s Team Top Level teammate) Craig Wescoe joins us to reveal a sweet Amonkhet Masterpiece! Aven Mindcensor debuted in Future Sight. The Bird Wizard has been a favorite of “Hate Bears” fans ever since. It is perfect against cards like Evolving Wilds or Scalding Tarn… Because it has flash, you can respond to the activation of a search land, and really mess the opponent’s selection plan up. The top of the Masterpiece does in fact indicate the card’s name. I know it looks like some crazy hieroglyphic stuff, but if you look closely, that’s actually a font. Ditto on the “type” line; this remains in fact a Bird Wizard. Bolas, Bolas everywhere! Nicol Bolas is all over this card. Not only can you see the dragon’s iconic horns int he background of this image, but stylized versions appear at the bottom-left, bottom-right, and all around the center hologram.